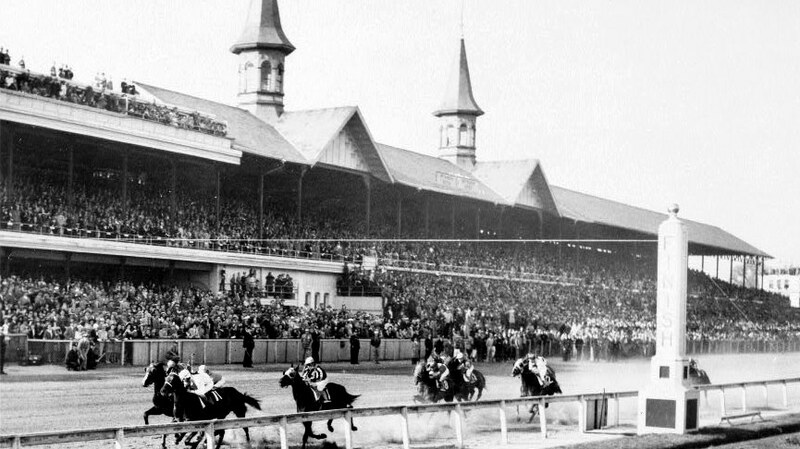 Churchill Downs is the city's race track today, but not long ago, there were many more. While Gormley, Classic Empire, and other top racehorses prepare for the 143rd Kentucky Derby this week, many locals are bracing for the tourist-fueled frenzy that has already saturated the city. Yes, the most exciting two minutes in sports is upon us. Widely regarded as Louisville’s most prestigious cultural asset, its origins stem from a long history of racing traditions that pre-date the Derby by more than a century. Beginning in the late 1700s, wealthy pioneers from Virginia brought with them racing steeds, imported from England, to their new settlements in Kentucky. Most notable of these Virginian landowners was William Whitley, who constructed the state’s first unofficial race track in 1788 on his estate in Lincoln County. According to tradition, the settlers realized that the limestone-filled hills were leaching magnesium and calcium into the bluegrass, which they believe helped build strong bones in the horses that grazed upon it. By the year 1800, horses were so popular in Kentucky that 92 percent of taxpayers in the state were equine owners. But if there’s one person who’s highly cited for popularizing horse racing in Kentucky, it’s Meriwether Lewis Clark, Jr.—the great nephew of Louisville founder George Rogers Clark. At the age of six, Clark Jr. lost his mother, Abigail Prather Churchill, and was forced to live with his his uncles, John and Henry. However, his mother’s side of the family was wealthy and well-known as horse breeders; the family estate included 300 acres of land in South Louisville, much of which was used for equine training. It wasn’t until 1872, when he visited the Epsom Derby in England, that he developed a proclivity for the fancy things: seersucker suits, champagne, and equestrian sport. These customs followed Clark Jr. to Louisville and became the foundation for what is now known as Derby fashion. 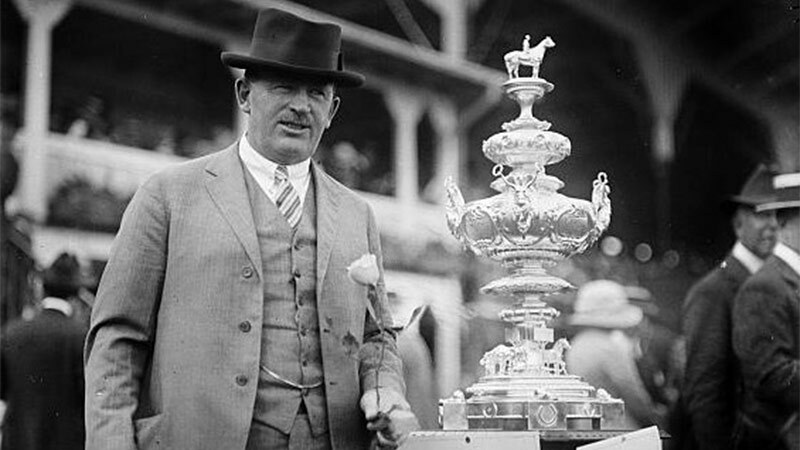 When he returned to Louisville the following year, Clark Jr. and his associates worked to establish an American version of the Epsom Derby, which was to be a series of permanent races in which the winners all faced off in the final contest: the Kentucky Derby. This plan led to the formation of the Louisville Jockey Club and Driving Park Association, founded in 1874. The original grandstand at Churchill Downs looks very different than today’s. 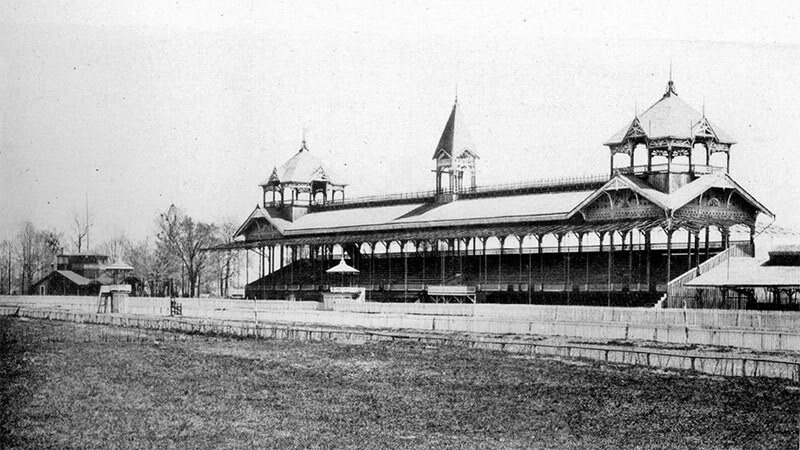 Churchill Downs’s original Gothic-style grandstand and clubhouse were constructed in 1875, modeled after Epsom Downs in Surrey. English architect and civil engineer John Andrewartha drew up the design. That early facility had the proud distinction of housing the only indoor toilet for miles around. The Kentucky Derby opened on Monday, May 17, 1875, on the inaugural meeting of the Louisville Jockey Club. It had been competing against two other races that day, both of which were considerably more popular: the Louisville Cup and the Gentlemen’s Cup Race. Oliver Lewis, an African-American jockey, rode Aristides to the finish line and was crowned the winner of the first-ever Kentucky Derby. Soon after, Thoroughbred racing rose to prominence as the most prevalent sport in the state. 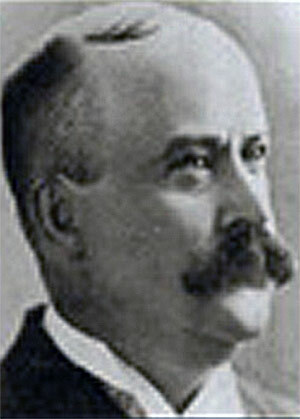 In 1894, architect Joseph D. Baldez from D.X. Murphy & Brother (known today as Luckett & Farley) was responsible for designing a new grandstand for Churchill Downs. He ended up creating the most iconic architectural statement in Kentucky—the Twin Spires—as an ornamental afterthought. Today, Churchill Downs stands as the only remaining horse racing venue in the city, but it wasn’t the first. Not by a long shot. 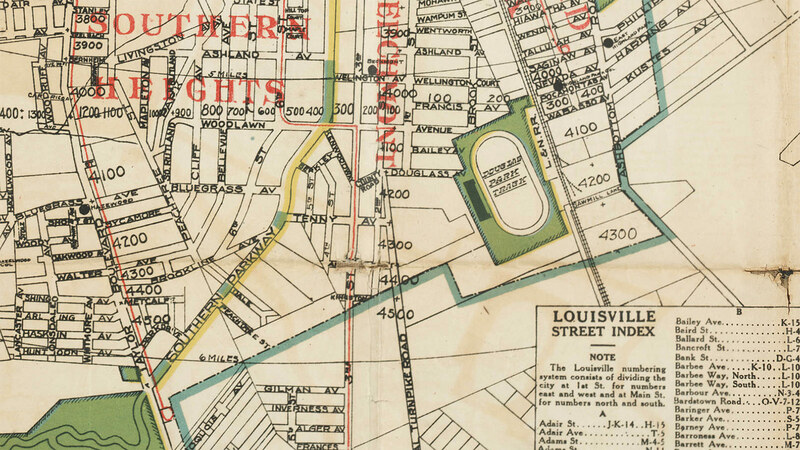 Louisville boasted a plethora of racing tracks over the years. They have long since vanished, but have not been forgotten. Here are six of the most notable. Louisville Downs depicted on a racing program from 1976. With its red-and-white striped roof visible from the Watterson Expressway, this standardbred park once occupied an 87-acre parcel on Poplar Level Road and featured harness racing on it’s half-mile track. 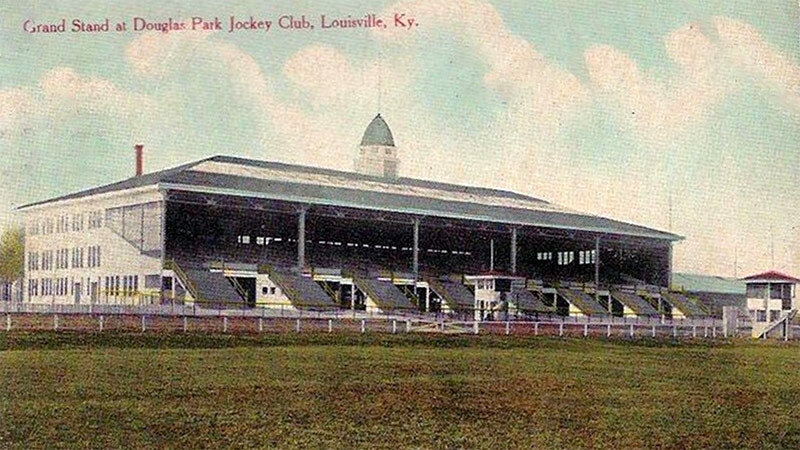 Founded by William H. King, who the Courier-Journal lauded as being “the track’s longtime marketing mastermind,” Louisville Downs opened to the public in 1966 and boasted a glass-enclosed grandstand and an infield lake. In 1981, King introduced “Call-A-Bet,” the state’s first phone wagering system. Seven years later, he began simulcasting races at the track and included broadcasts from Turfway Park in Northern Kentucky. Churchill Downs purchased the site for $6 million in September 1991 and transformed the track into a Thoroughbred training arena known as Trackside. The deal officially brought an end to harness racing in Louisville. In 2015, the decision was made to demolish the iconic grandstand, wherein officials cited structural deterioration. However, the original stables and track are still used by Churchill Downs as a training facility. Next time you’re in the Beechmont neighborhood, take a leisurely stroll down Kenwood Way. Watch for the intersection where Second Street turns into Southside Drive, and you’ll discover Historical Marker No. 2336, which notes the former location of Douglas Park race track. 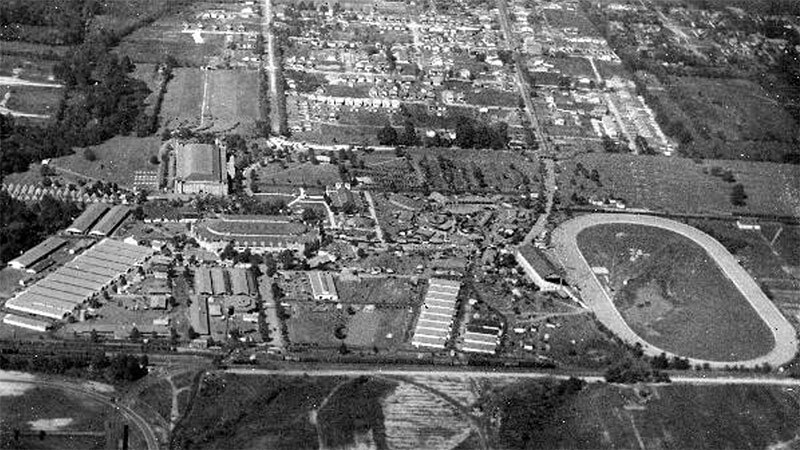 Wedged between what is now Americana Community Center and Strawberry Lane, the original Douglas Park occupied 122 acres and featured stables, a clubhouse, a grandstand not unlike Churchill Downs, and a track that stretched one mile across. 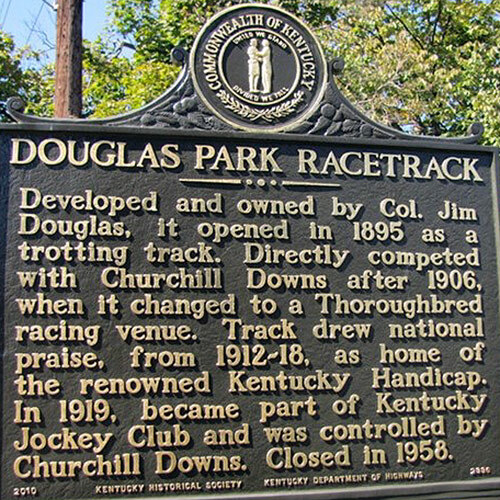 Colonel James J. Douglas founded his namesake track in 1895, the same year the park opened to the public. 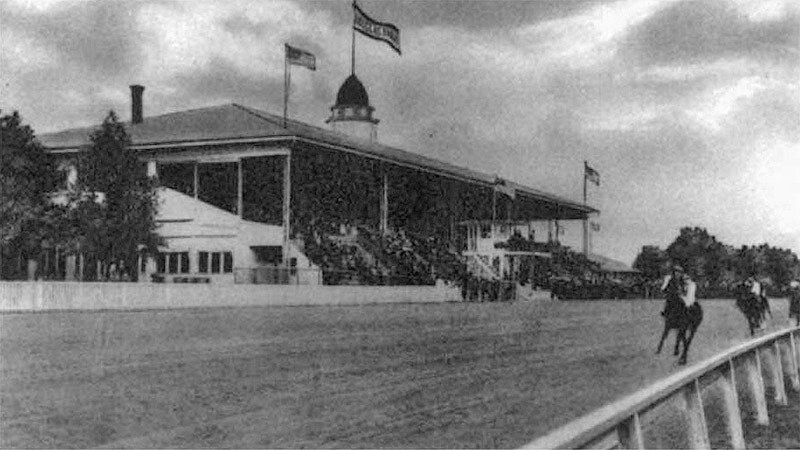 Initially, Douglas Park was to be used exclusively for trotting and pacing races, but after a seven year hiatus, the venue switched to Thoroughbred racing when it reopened in 1913. Former site of Douglass Park. In 1918, Churchill Downs purchased Douglas Park and immediately halted all races at the track. Nearly 20 years later, the Douglas Park grandstand and clubhouse were demolished. Successive fires throughout the 1940s and ‘50s destroyed numerous barns and stables, and portions of the property were sold off to recoup the losses. The Archdiocese of Louisville purchased 21 acres of the Douglas Park property in 1950. St. John Vianney now stands on the site. After selling off the remaining horses and stables, Churchill Downs ended all equine activity at Douglas Park in 1958. They leveled all remaining barns on the property and seeded the ground with grass, leaving the rest to history. 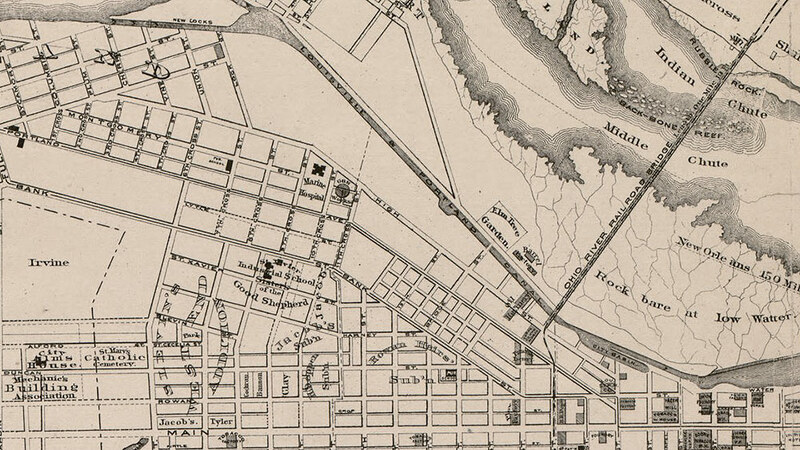 1873 map of Louisville showing Elm Tree Garden on Shippingport Island. Considered to be Louisville’s first amusement park, Elm Tree Garden (originally Elm Tree Pavilion) was founded upon Shippingport Island and opened to the public on June 6, 1829. The Garden was created by Joseph L. Detiste, a French native, and featured mazes, puzzle gardens, and a race track. During this time, the Falls of the Ohio was primarily occupied by French settlers, whose fur-trading businesses carried them upriver from New Orleans. This was also the age when horse racing in Louisville was at its peak and competitions frequently took place on downtown streets. In an attempt to draw pedestrian traffic away from busy thoroughfares, the Elm Tree Garden advertised its own horse races and even provided a gondola service to ferry people across the Ohio River. However, the Garden never fully recovered from the economic losses following the flood of 1832. After years of financial struggle, the amusement park was permanently closed in 1873. The story of Woodlawn Race Course began in 1858, when a wealthy horse breeder named Robert Aitcheson Alexander purchased a tract of land on the eastern border of Jefferson County, in what is now the Woodlawn Park neighborhood. The race track proved to be a massive success when it opened to the public in 1859, attracting large crowds of people dressed in colorful attire. Such vibrant gatherings were previously unheard of in Kentucky, but the tradition endured and carried over into other racing venues of the day, including, of course, Churchill Downs. Most of the accounts regarding the park’s design and layout come from the Louisville Daily Courier, a defunct newspaper that ran throughout the 1850s and ‘60s. Some sources say the interior of the clubhouse was elaborately decorated with intricate crown moldings and mantelpieces. Others claim the building had a tin roof equipped with an overhead hatch. During the park’s heyday, Alexander had commissioned Tiffany & Company to design a special vase as a trophy for the winners. What resulted was the Woodlawn Vase, which served as the template for the current trophy given to the winner of the Preakness Stakes in Baltimore, Maryland. 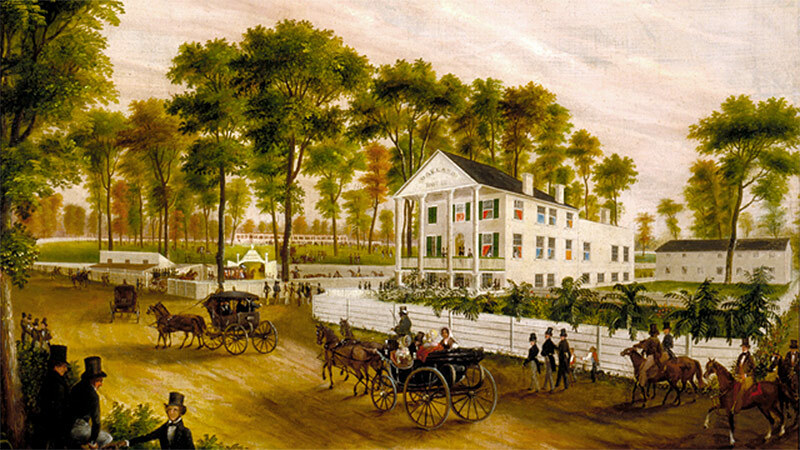 Woodlawn earned the reputation of being the “Saratoga of the West”—a reference to a race course in Saratoga Springs, New York, that was popular throughout the 1860s. 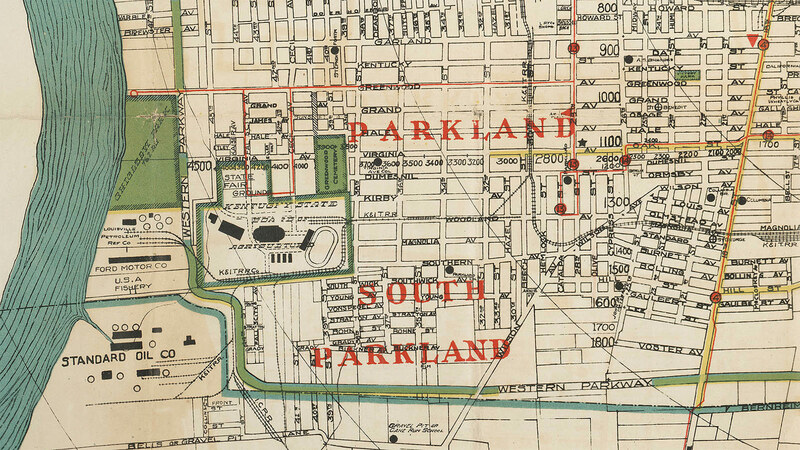 However, like many race tracks at that time, Woodlawn couldn’t sustain its debts and was forced to close in 1870. Located on the southern terminus of Cecil Avenue in the Parkland neighborhood, this track opened as a full-time racing venue in June 1956 as Fairgrounds Speedway. The track and original grandstands date further back as part of the old Kentucky State Fairgrounds facility. 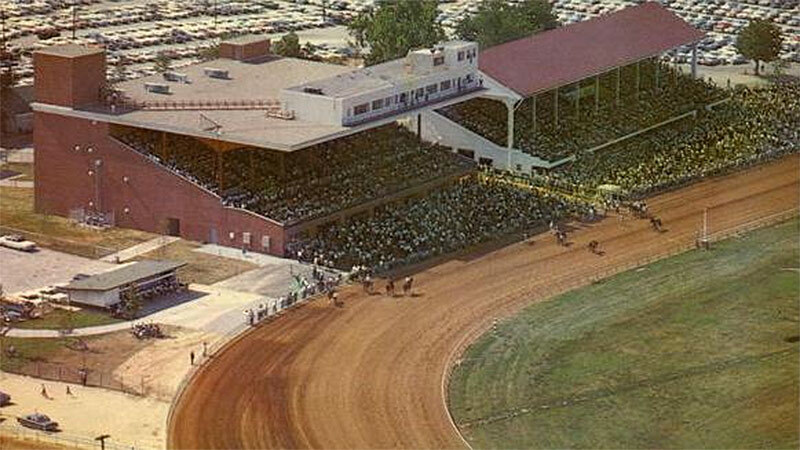 The venue was initially used for harness racing, but after two years, the park was sold to General J. Fred Miles, who turned it into a Thoroughbred track and renamed it Miles Park. Miles Park at the old fairgrounds. The park came under new management in 1974 and was renamed, this time as Commonwealth Race Course. Legal entanglements between the park’s new owners and the Kentucky Racing Commission caused the track to fall dormant for several years. Things eventually picked up in 1977 when, once again, new owners purchased the park and experimented with quarter horse racing. But success didn’t last long. In June 1978, a fire destroyed the grandstand, forcing the park to permanently shut down. Industrial facilities now occupy the site, with no markers recognizing the history of racing that once took place there. 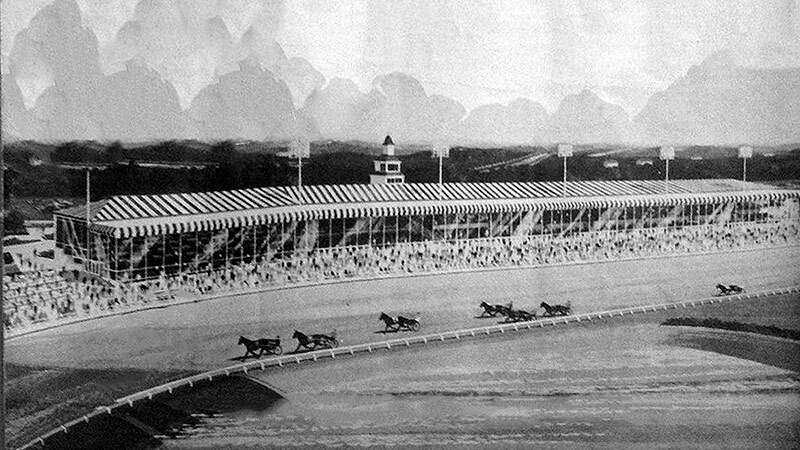 “Oakland House and Race Course” by Augustus A. Von Smith and Robert Brammer is in the collection of the Speed Art Museum. This course was developed through a sponsorship from the Louisville Association for the Improvement of Breed of Horses, for which Samuel Churchill served as the president. In 1832, the group purchased a 55-acre plot of land on modern-day 7th Street and Magnolia Avenue in the Old Louisville neighborhood and founded the Oakland Race Course. It was hoped that the event would help pull Oakland out of financial hardship. But after years of struggle, the facility eventually closed, with its last race held in the mid 1850s. Perhaps one of the best-preserved artifacts from the course is an 1840 painting titled “Oakland House and Race Course” by Augustus A. Von Smith and Robert Brammer (pictured above), which reveals a wooded fairground bordered by a white picket fence.